Anverso El buscador de oro y su burro en un ambiente desértico. Reverso Una silueta de la imagen de un Buscador de Oro. El buscador de oro y su burro en un ambiente desértico. Una silueta de la imagen de un Buscador de Oro. Ronda de plata Ficha de Poker - Silvertowne Buscador de Oro de 1 oz Get some prospects when you purchase any amount of 1 oz Silvertowne Prospector Poker Chip silver rounds through our online store today. The prospector portrayed in the Silvertowne products is known an explorer who invests his time searching for mineral and precious metal deposits. The obverse features an animated version of the prospector observing his gains with his trusted yet surprised donkey at his side. 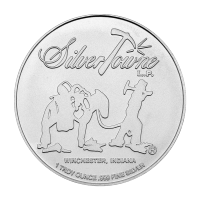 The reverse of this round features a silhouette of the classic prospector image along with the Silvertowne logo, and the words "Winchester, Indiana 1 troy oz 999 fine silver" . Celebrate the "Gambler like" characteristics of the prospector with your purchase of 1 oz Silvertowne Prospector Poker Chip silver rounds today.